Just one of these sweet little treats makes a nice gift when wrapped individually in a cellophane bag. If you’re bringing them to a party as a hostess gift, arrange them on a plate. Chances are, they won’t make it until the end of the party. In large bowl, combine butters, vanilla and salt using electric mixer. Add sifted powdered sugar one cup at a time, whipping to fully incorporate. Dough will be fluffy but firm; chill briefly if sticky. Insert pretzel or stick three-fourths of the way into each ball; place on parchment-lined baking sheets; refrigerate at least one hour or overnight. Place chocolate in small microwave-safe bowl. Microwave 30 seconds on high, stir and continue to microwave in 10 to 20-second intervals, stirring after each until chocolate is melted and smooth. 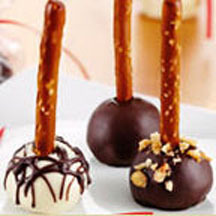 Dip pops in melted chocolate up to the stick, allowing excess chocolate to drip off; sprinkle or dip bottom of pop in garnishes and return to parchment-lined baking sheet to allow chocolate to set or refrigerate pops briefly. Store pops in airtight container at room temperature for up to 1 week. Makes about 50 (1-inch) bonbons. *Any nut butter may be substituted; try almond, hazelnut or peanut butter. **Bittersweet, milk or white chocolate may be substituted.